Danielle Williams is the founder of the social media platform Melanin Base Camp, and a co-founder of Team Blackstar Skydivers. Both organizations promote diversity in outdoor adventure sports and highlight talented adventure athletes of color. She's also a former trail runner and a disabled skydiver with over 600 jumps. Danielle graduated from Harvard in 2008 and has spent the last nine years in the U.S. Army with combat deployments in Iraq and the Philippines. The Army threw her out of her first airplane in 2006 and she's been in love with adventure sports ever since. 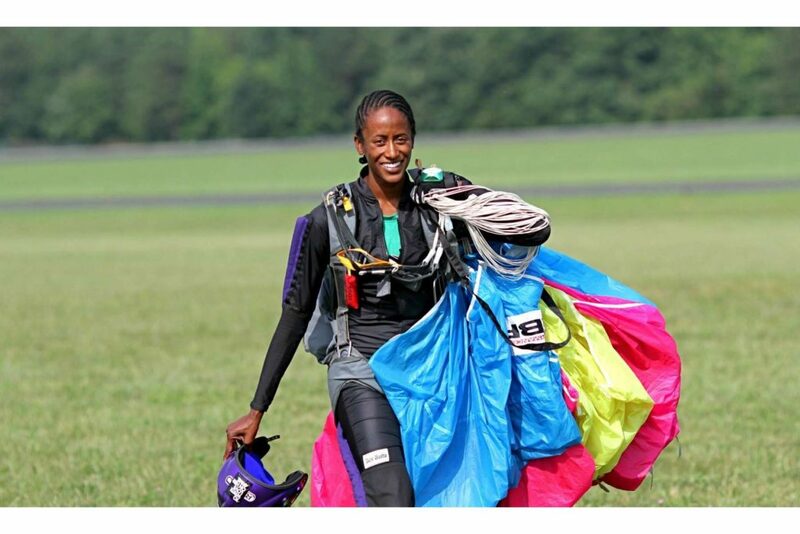 Her skydiving team, Team Blackstar, was founded in 2014 and has since grown from six African American parachutists to a diverse group of 240 skydivers in six countries. Most recently, Danielle partnered with Brown Girls Climb on Project Diversify: the first ever video collaboration showcasing Women of Color in adventure sports. In this episode, Danielle tells the story of why she joined the military and what it's been like being a woman in a male-dominated space. We talk about her first time skydiving and why she loves the sport so much even though she's scared of heights and isn't at all an adventure junkie, and she shares her thoughts on managing fear and on mental toughness. Danielle also shares the origin story of Melanin Base Camp - why she started out, what the mission is, and why it's so crucial that everyone play a role in diversifying the outdoors. I've personally learned so much from Danielle since I first started following her on Instagram, and it was such a delightful honor to have this conversation. I hope you enjoy it too! I agree that everyone should feel welcome in the outdoors, of course. But I disagree strongly that nature is unavailable to anyone. Yes, National Parks cost money and can be a challenge to get to. But, nature is not National Parks! Nature can be found anywhere. You can get out on a bike path or park in a city and still find nature. If you want to be in “nature” you can find a way and it doesn’t need to be in a National Park to be valuable.